November 18th, 2015: I found this in my P.O. Box. Never heard of Budi Setiawan, (s? )he is just another previous resident that left behind a zombie catalog virus. I'm keeping it because I'm AKA Current Resident at that address. BTW: if you want to trade postcards, send me something there and I'll reply with something else. For sure if I find what you send an interesting sight, a photograph of it will appear here. September 1st, 2015: I'm hoping Obama makes an impression on somebody with this road trip! June 18th, 2015: While I was putting this picture up I was listening to NPR talking about Pope Francis's (sorry if I spelled his name wrong) big announcement on the climate change issue. Sounds to me like he's saying "everything's connected to everything else", as my Dad would put it. He's also saying we need a moral and practical response to this issue. Amen Brother! 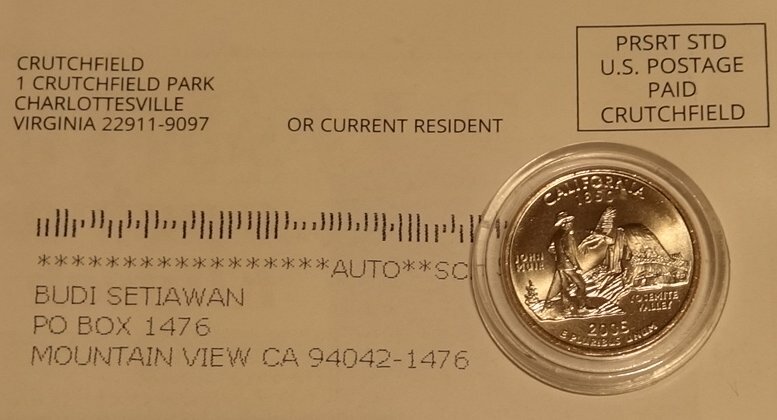 July 7th, 2015: I had to go to the Coin Broker to find this coin! Just don't have any Latvian coins from my pocket change. September 25th, 2015: I was hoping to go to critical mass in San Francisco, but the karma gods in the sky had other ideas for my evening. My first clue was feeling the nudge as the train fell off the schedule. Mere moments later the power went out and the train stopped. Then the conductor came on the intercom and said we'd be parked for at least a while. Next we had to wait in or near our seats for an hour or something like that. David in the next seat over I'd ridden in critical mass with many time before. We met the women across from us. He poured everybody some nice red wine. The whole neighborhood turned into a nice party. The guys across the walkway passed around their cell phones with pictures of the mashed cars behind us. Looked pretty bad. Good thing there were no fatalities. Finally the train pulled back to the station and let us out. It was obvious from looking at the clock that the opportunity to do critical mass was behind us. Ended up riding around in San Mateo County for a few hours with David. We saw part of a high school football game among other distractions. I mention this because I've noticed that different people use the word "feel" to mean different things. What does the word feel mean to you? Unless I know you fairly well I just don't know. For me the comfortable use of the word comes across in the sentence "I can feel the art on that coin with my fingers." I know that the blind use their fingers to feel the patterns in bumps to read words, but I'm not one of them. I've known other people that say "I feel you" when I would have said "I hear where you're coming from." For sure everyone on that train "shared the experience", although many have different ways of expressing their feelings about it. My feeling is, at some point it all boils down to "water under the bridge", to mix my metaphors in an effort to make the point. November 11th, 2015: I found this glowing blue magic number thing in my junk mail yesterday. It came out of a piece of junk mail that said if I take it in to some car dealership I could find out if I won some unbelievably extravagant prize. Usually the buildup on that kind of thing is better than the payout. Since my need for a car of my own right now is zero, I'd rather mine the number for entertainment value. If you need a random number for some reason, you're welcome to consider all or part of the above. That American Samoa quarter is the first one of that type I've found in my change. It came in at San Francisco's Bike Party in January of 2012.